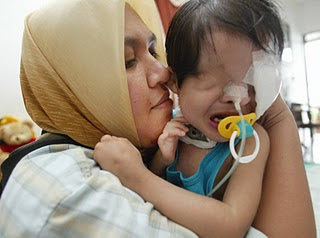 Just a note to say that Siti Aisya has passed away, at 5pm (Malaysian time), April 19th, 2010. I have no further news as I can't call the family from where I am, but I thought the readers who helped raised funds (about RM 14 450 in cash, with others donating/sponsoring in kind: diapers, milk, glucose, and food, which was enough to cover her needs for a year) for her would like to know. You have all made a difference in the little girl's life. May her soul rest in peace, and may the family find some solace in their tremendous loss. Her father called Andri late this evening. Overwhelmed. My deepest condolence to Siti Aisya's family. Went to their house this morning but nobody was home. I guess they brought her body balik kampong. Yeah, I know...I was in shock too, and too far away to do anything. I got my mum to call on my behalf, as really, how do you convey condolences in an sms? I know--they did balik kampung. Mum spoke to Kak Yatie and told me. Thanks for doing all that you've done.